It won’t take more than 3 minutes to fix SSL Connection Error. Let’s check out the guide given below using which you can fix the error right away. If you are a frequent internet user, then you might have witnessed an SSL connection error popping of nowhere on your android device. Actually, it’s a common problem that most of the android users face while using their default browser, i.e., Chrome. This makes the Android browser experience very much unreliable, and you can’t do anything about it. 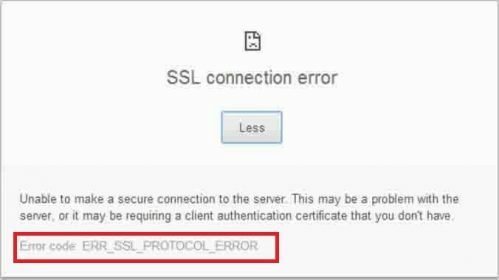 However, some geeks around us found a few ways which will help you in getting rid of SSL Connection Error. If you are one of those people facing this common issue on your device, then worry not! We’ve got your back, as we are going to share the simplest to fix the SSL connection error on any android device. In case, if you are wondering the reason behind this error, then we’ve got that for you as well. Just stick to the article till the end to know everything about SSL connection. So, let’s first start off by showing you how this error looks like on Android devices. Whenever you open up your chrome browser to search the web. Both the errors are same and common. In fact, it’s nothing but err_ssl_protocol_error. It’s not something that you should worry about. The issue can be rectified within a few simple steps, which can be done by anyone. You don’t need to some sort of expert or tech-savvy in order to get rid of this issue. You can view the below attached to see how the error looks like. First of all, the common abbreviation of SSL is Secure Socket Layer. It’s a certificate which does the job of authenticating the websites that you are browsing or visiting. In layman terms, if you see an “SSL Certificate” on any website, it means your connection to the site is encrypted and is private. Getting an SSL certificate isn’t easy, the certificate issuers go through the website and verifies its identity before issuing the certificate to the site. All this is done with an intention to keep the user’s data safe and private. In case, if your connection to the website isn’t private, then all the data that you are sending or receiving is kept open which can be manipulated by any third party person. It’s crucial to have an SSL certificate on the websites that you are visiting. So, I hope, you’ve come to know what an SSL certificate is all about. Now let’s move on to the other topic. There are several causes for this error to pop up, you can’t predict the exact reason. Sometimes, even the simplest mistakes may result in the SSL connection error on Android (Samsung, Sony, LG, Panasonic, One Plus, Micromax, etc). Below are reasons which are most likely to cause the SSL Connection issue. Incorrect Date And TIme on your device may cause this error. Yes, you heard it right, if you don’t have the correct date and time set, then you are most likely to see this error whenever you visit any site. The security of Website checks and verifies your date and time before establishing the connection. If there’s any firewall sort of setup between you and the website, then it’s pretty obvious to get this pop-up. Make sure you don’t have any firewall enabled on your device, usually in offices, it is enabled by default. In case, if the SSL certificate authority isn’t trustworthy, you will end up seeing the issue. In such situations, the SSL certificate itself isn’t trustable. Well, this is not something from the user end, its the website owner that has to look into it. Reporting the issue to website owner is a good practice. This common error can occur if there’s any sort of mismatch in the certificate. Well, you don’t need to install any third party app or software to fix this issue. It’s a simple error that can be rectified with some simple settings on your device. You can follow up the below-mentioned methods to get rid of this error in no time. Some of these methods can be applied to PC as well, they will definitely help you regardless of platform. No matter you are on a PC or Android, it’s important to keep the date and time updated. Simply go to your Settings -> Date & Time -> Select Automatic. You can also set the date and time manually if you don’t see the automatic option. This will most probably prevent you from seeing this error on your browser. Give it a try! If the above method doesn’t work, then here’s another simple fix. Open up your browser, for example, Google Chrome -> Settings -> Clear history, cache, and cookies. Now just restart the browser, and you won’t be seeing this error ever. If you are PC, simply press Ctrl+Shift+Delete at the same time to clear the data of your browser. Sometimes, the antivirus software installed on your PC or Android will cause such errors, let me tell you how. The antivirus software will block some pages that do not look trusted (without SSL certificate). In such cases, you will encounter the error on a web browser (it can be Google Chrome, Internet Browser or Safari). The best solution to the issue is changing the settings of the Antivirus software. Here is what you need to do, follow the instructions given below. Close all active windows on your PC or Android device. Close all web browsers for now. Open the control panel of the Antivirus software. Navigate to Settings >> Advanced Settings >> Network. I am not sure about the path but you will definitely find such an option under advanced settings in any antivirus software. There you will see something like “Encrypted Connections Scan“. Just disable it to scan the encrypted settings that you have got. Save the settings and restart your device. Open up the web browser and try accessing the same website using the better working internet connection. Everything is super fine if the website loads well this time. Or else, follow the instructions provided below. Open up the web browser (Google Chrome), and tap “Customise and Control Google Chrome“. Scroll down till you see the option “Change Proxy Settings“. It will open up the internet properties of the web browser (Google Chrome or Firefox). Move on and find out “Security Level for this Zone” and keep it medium. You should do the same in Privacy tab as well. You can find it besides the current tab. Now, Move on to the next tab “Content” and scroll down till you see the option “Clear SSL State“. Close the browser and try re-accessing the same website. Hope it works this time, follow below-given methods if not. Having the latest version of installed apps can significantly improve your overall experience. If you have an outdated browser, then this error may arise. To update the app, just open up Google Play Store, select “My Apps” and update your browser from there. Doing this wouldn’t take much, and it can play a vital role in getting rid of this annoying error. Launch the google chrome web browser and find out “Customize and control Google Chrome” at the top right corner of the window. A pop up will come up and tap “Show advanced settings“. Scroll down till you see an option “Manage Certificates“. A new pop up will come up again. There you can import if have any certificates on your device, so that, it the browser will follow up them. Save settings and relaunch the google chrome web browser and try accessing the same website. This method has the highest possibility to fix the issue. Don’t worry, you have few more methods to check out. In case, if any of the methods mentioned above don’t work, then the only left option you are left with is Resetting. There’s nothing much you can do at this point, rather than doing a factory reset on your Android device. Make sure you take all backups of data, then reset your device. To reset your device, open the settings on your device, scroll down to the option “Reset And Backup“. Now just select the reset option and wait for the process to be completed. SSL Connection Error is not a big issue and you don’t need to worry about it at all. I have tried out fixing the issue using the fixes provided above and it worked fine for me. Try them out and fix the issue on your devices too. Share this guide with your friends, thank you.